U.S. 33 and Indiana 15 shield assembly posted as the tandem turn left from Main Street onto Pike Street in downtown Goshen. Photo taken by Thomas Decker April 9, 2010. 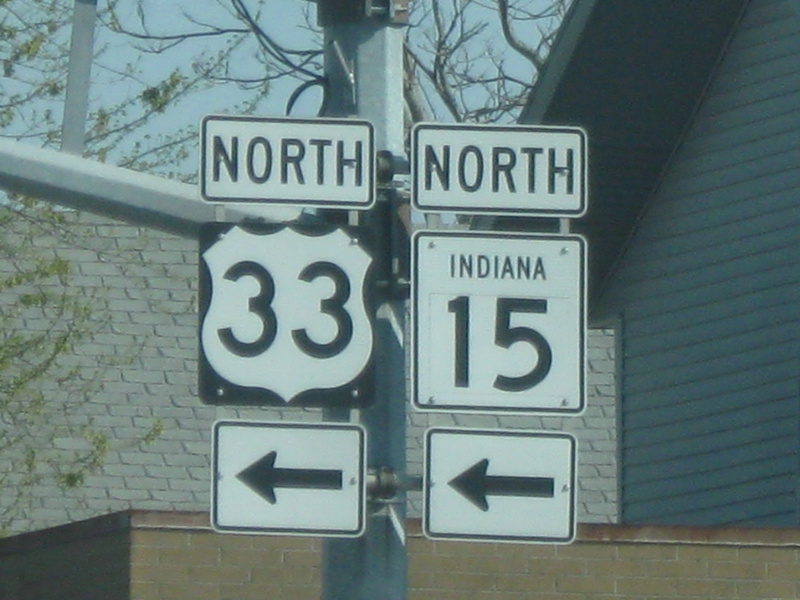 Indiana 15 is a 95-mile north-south state highway that goes across Northern Indiana from its southern terminus at U.S. 35/Indiana 22 in Jonesboro in Grant County and heads up to the Michigan state line north of Bristol. On the way, it goes through Marion, Wabash, Warsaw, and Goshen. Though it is not a major highway, it does provide access to several county seats and is perhaps the most important north-south road in between U.S. 31 and Indiana 9. Exit 101 of Interstates 80 & 90 links the Indiana Toll Road with Indiana 15 in an agricultural area north of Bristol and east of the St. Joseph River. SR-15 leads north 1.8 miles to M-103 and southwest 1.5 miles to a short merge with Indiana 120 (Vistula Street) in Bristol. Photo taken 11/04/11. A three-lane toll plaza resides on the access road between Indiana 15 and Interstates 80 & 90. Photo taken 11/04/11. Toll booths were not attended at the time of these photos. Change is made for those paying with cash at the departure of Interstates 80 & 90. Oncoming traffic simply takes a ticket. IZoom, which is compatible with the E-ZPass system, customers may pass through the plaza after a brief pause otherwise. Photo taken 11/04/11. Entering the trumpet interchange with the Indiana East West Toll Road from Indiana 15. Interstates 80 & 90 next meet U.S. 131, 6.7 miles to the east, and Elkhart County Road 17, 4.6 miles to the west. Photo taken 11/04/11.